Recordings & Slides are available ! 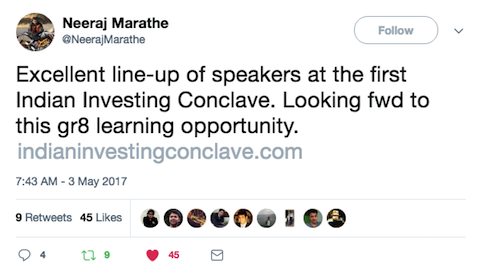 Indian Investing Conclave 2017 was broadcast on 17-18 June 2017. We had 16 instructors who shared their top investment ideas and showed participants how experts go about analyzing a business, assess management quality and determine the valuation.